McDonalds in Carrickfergus, near the castle. Open 24hrs drive thru only Friday and Saturday. Have you got Google Earth on your computer? If so, then download the Google Earth Map of McDonalds Carrickfergus. Is this the wrong position for McDonalds Carrickfergus? If you think so, then modify its position. HUH - yeah open all sorts of silly hours but unless you have wheels they wont serve you! how ridiculous! 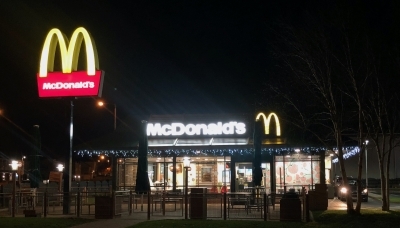 maybe they should learn from the true customer service that Micky Ds provide in USA, This shop should not be allowed to carry the McDonalds logo. a disgrace. rude and unhelpful. is this service part of the McDs ethos! i strongly doubt it!